Do you face problem removing stiff makeup? Have you also encountered the problem of itchiness, redness and rashes after struggling to remove your makeup? If yes, then I have the perfect solution for you. 2-in-1 oil and water formulation - oil lifts out makeup and water refreshes the skin. Gently but thoroughly removes all kinds of makeup. I bought this product on a recommendation and absolutely loved it. I tried it to remove eye makeup like removing the thick kajal, eyeliner and eye shadow; and was so happy with its effectiveness. A good makeup remover is one which works effectively on the sensitive parts of our face like the eyes and this one got an A+ here. The oil in the formula, effortlessly removed the makeup around my eyes without leaving them puffy, eye and itchy. 1) Easy to use. Just apply a little on a cotton bud and swipe on the makeup applied area. 2) Doesn't adversely affect the skin by leaving rashes, redness, puffiness and itchiness. 3) The oil and water formula makes it quite effective and it works beautifully even on the sensitive areas of the face. 5) Best makeup remover that I have used till date. 1) A bit greasy due to the oil. So when applied in bulk to remove the makeup, we may have to go and wash our face with facewash to remove the oiliness. However, this doesn't usually happen because only a small quantity is enough to remove the makeup. 2) Has to be shaken thoroughly before each use, so the oil and water mix to give the best results. I absolutely loved this product and strongly recommend it to everyone. 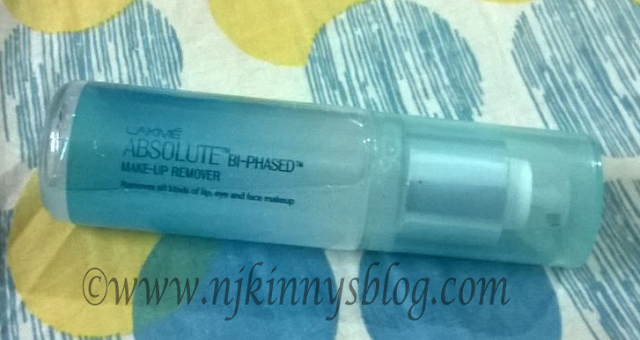 If you are looking for a value for money product which removes makeup easily and doesn't harm your skin, then Lakme Absolute Bi-Phased Make-Up Remover is for you. This is the best makeup remover that I have used so far.